OVIPanel provides Mysql database which is very fast, reliable, scalable, and easy to use where you can create unlimited databases as per your requirement.The MySQL Database consists of a multi-threaded SQL server that supports different backends, several different client programs and libraries, administrative tools, and a wide range of application programming interfaces (APIs). MySQL Database today offers a rich and useful set of functions. Its connectivity, speed, and security make MySQL Server highly suited for accessing databases on the Internet, So it used by many PHP applications such as forums and e-commerce systems. 1. MySQL is a very powerful program in its own right. It handles a large subset of the functionality of the costliest and strongest database packages. 2. MySQL makes uses of the standard method of the leading SQL database language. 3. MySQL works on several operating systems and with many languages including PHP, PERL, C, C++, JAVA, etc. 4. 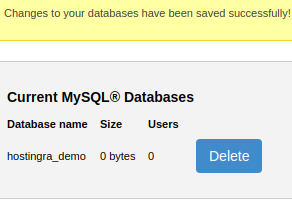 MySQL works very quickly and works well even with large datasets. 5. 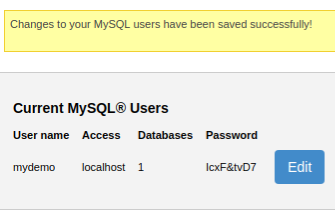 MySQL supports large databases, consisting upto 50 million rows or more in a table. Default file size limit for a table is 4GB, but you can increase this (if your operating system can handle it) to a theoretical limit of 8 million terabytes (TB). Step1: Enter database name which you want to create under the textbox and click on Create. 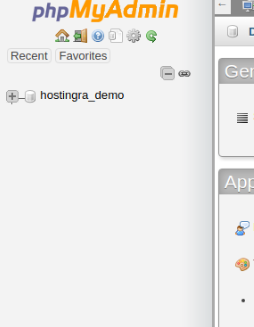 Step2: Now you will be able to see the database details along with size and users. 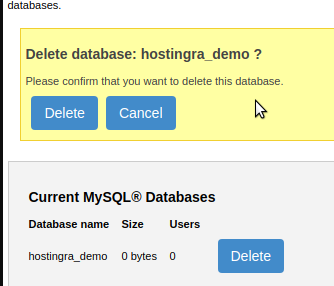 When you wish to cancel the particular database simply click on delete.It will ask for the confirmation for the same.once you confirm it, it will be deleted. 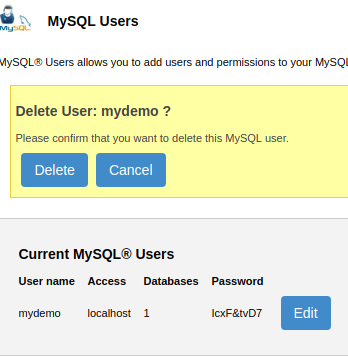 Once you created your database you need to take precautions in securing your data and managing the users who have access to this data by using Mysql User Module.You don't want to give root access to every user, which gives each user complete control of your server. Instead, root access is restricted to very few people, and then each additional user has its own unique permissions means You may have database administrators of different levels. You might want to give access to one database to one administrator, and then give access to a second database to a different administrator. You might want to make your security more granular and only give certain users access to specific tables. Keeping track of users and their permissions greatly reduce the chance that your database goes hacked without notice. By managing users, you can keep control over your data and protect it from unauthorized access.Keeping track of users and their permissions greatly reduce the chance that your database goes hacked without notice. By managing users, you can keep control over your data and protect it from unauthorized access. Step1: Enter username without any special characters and select particular Database from the drop-down menu. Step2: Select the Remote Access you want to give for a particular user i.e Allow from localhost IP or Only from single IP. If you select single IP then you need to enter the IP. 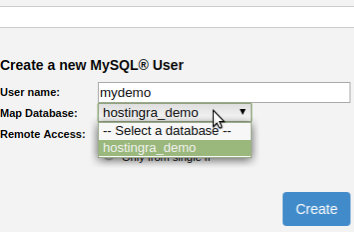 Step3: Once you fill all these data click on Create and now you will be able to see the Mysql users details with access, database, and password. Note: Password is created automatically and you can change it by clicking on Edit. If you want to change the password or need to add or remove database you can manage it here. The password should be written manually or by clicking on Generate Password.The password should consist of 9 digits with at least 1 number, 1 Uppercase, 1 lowercase and 1 special character. If you need to cancel the user just click on the delete. It will request for the approval for the same. After the confirmation, it will be deleted. 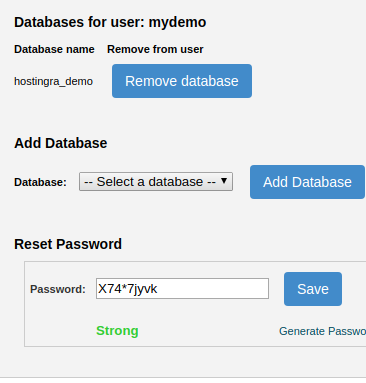 Once Database and user are created phpMyAdmin Module is a great way to interact with your database. It allows you the flexibility of using the interface or simply using SQL commands directly.It has all common functions that you may need when developing a MySQL-based application or website. It can export and import database created and managed by MySQL DBMS, as well as work with some other data formats. The list of supported formats includes SQL, CVS, CodeGen, CVS for Microsoft Excel, Microsoft Word 2000, JSON, LaTeX, MediaWiki Table, OpenDocument Spreadsheet, OpenDocument Text, PDF, PHP Array, Texy! Text and YAML data types.PHPMyAdmin is a perfect tool for browsing the database, managing user privileges and executing SQL queries, it can’t be considered as a full-featured administration tool. 2. Support for most MySQL functions like browse, drop, create, copy and alter databases, tables, views, fields, and indexes, execute MySQL queries, manage stored procedures and functions. Import data from CSV and SQL files. 3. Export data to various formats: CSV, SQL, XML, PDF, ISO/IEC 26300 - OpenDocument Text and Spreadsheet, Word, Excel, LATEX, and others. 4. Searching globally in a database or a subset of it. 5. Transforming stored data into any format using a set of predefined functions, like displaying BLOB-data as image or download-link. 6. It also provides a console where we can execute a query. 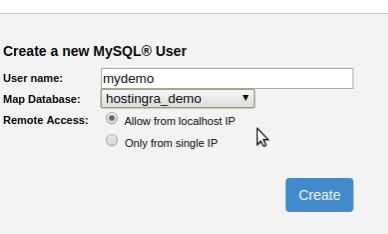 >>>> Now in here you will find an option name "launch phpMyAdmin"